Was it all steers and Stetsons? 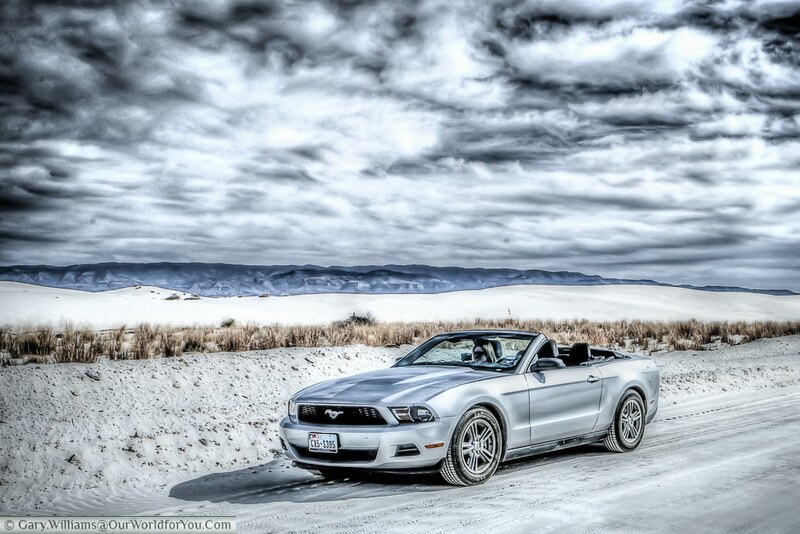 Yeehaa, all saddled up in our Ford Mustang we headed off on a two-week road trip adventure around Texas & New Mexico. This trip may have been a few years ago now, however, the memories are still so fresh in our minds. Gary and I often find ourselves chatting about our previous trips, recalling particularly moments that stand out for us. Our Texas and New Mexico road trip was no exception. 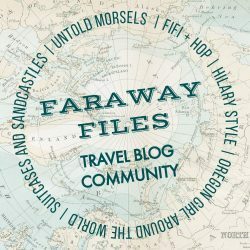 We have narrowed down our high points to share them with you, and hopefully, they tempt you into creating your own adventure, which you can then share with us. Big Bend National Park – whenever we embark on an American road trip we always search out the surrounding National Parks & Monuments. 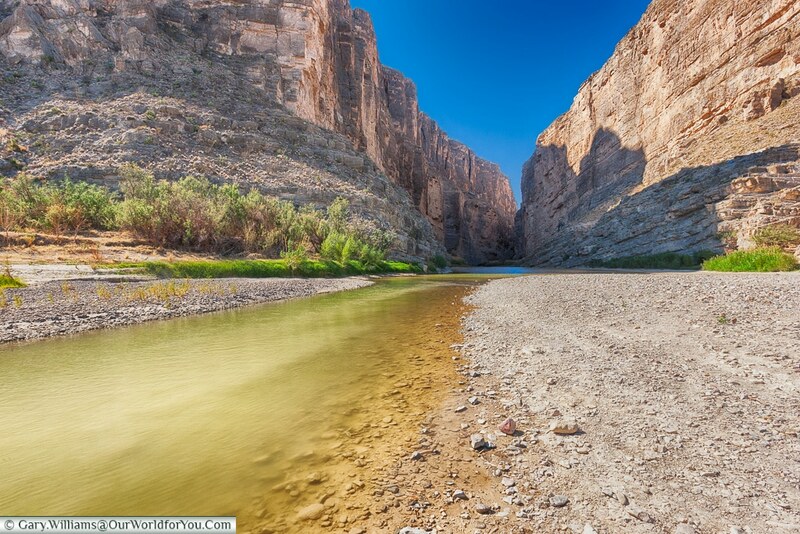 In western Texas, we visited Big Bend National Park, with the Rio Grande running along its border to Mexico. We picked up one of the parks maps and headed for the scenic drives. some of the roads are paved, and some are dirt tracks, but all surrounded by stunning landscape and incredible views. 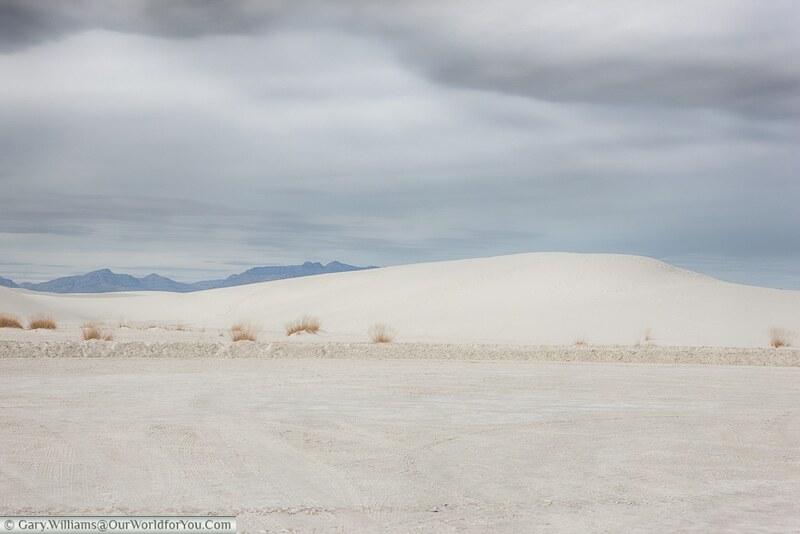 White Sands National Monument – Almagordo in New Mexico. This National Monument is incredible, although the name gives it away and the landscape is sand, it actually looks like snow. Families even bring along their sledges and slide down the gypsum sand dunes. National Parks Service – If you are visiting several National Parks, it is often cheaper to purchase an annual pass, rather than pay at each individual park. The annual pass is currently $80 and allows entrance to the pass holder plus three additional adults. 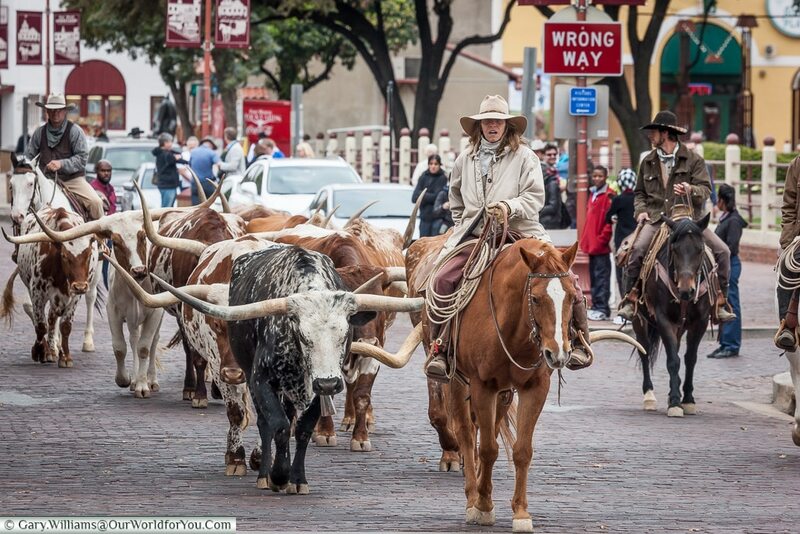 Stockyards, Fort Worth – Perhaps you could be forgiven for feeling like you have stepped into a wild west film set, but Stockyards in Fort Worth is a bit surreal (but in a good way). 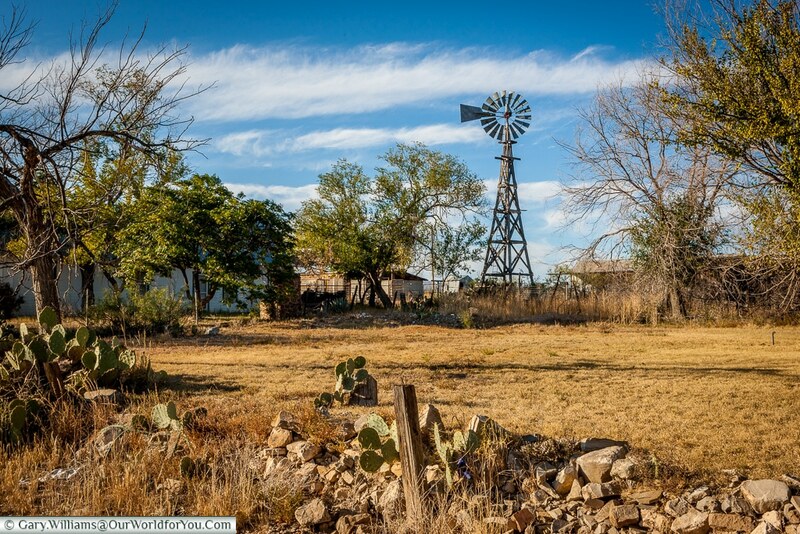 If you are visiting here, then you need to immerse yourself into all things cowboy. 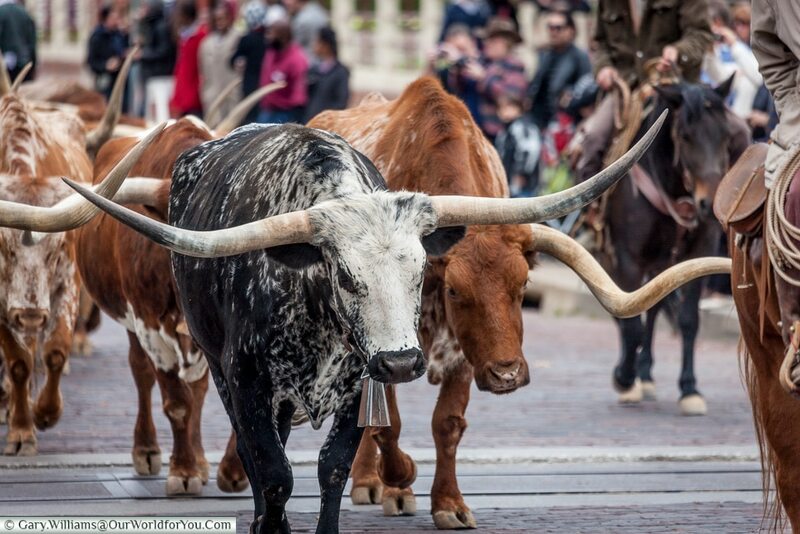 Watch out for the cattle run through the town; those horns look like they could be painful. 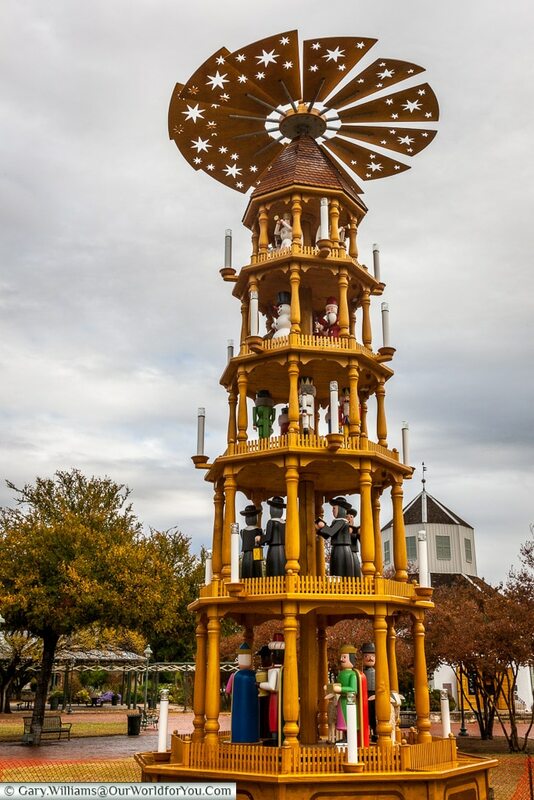 Fredericksburg – This was something I didn’t expect to find, a little bit of Germany in the heart of central Texas. Not only does it have German bäckerei and Biergarten, but it also had a traditional rotating wooden Christmas pyramid. Dallas Grassy Knoll – A little piece of history, no trip to Dallas would be complete without a thoughtful stroll around Dealey Plaza and Elm Street. As you probably know it’s where JFK was assassinated in November 1963. 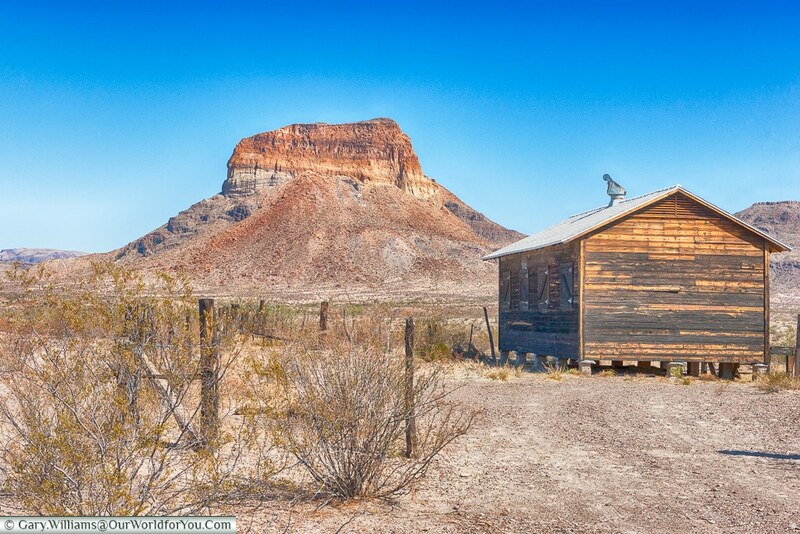 Terlingua Ghost Town – near Big Bend NP is Terlingua Ghost Town a once bustling mining town in the mid-1880’s, however, over time the population has dwindled. 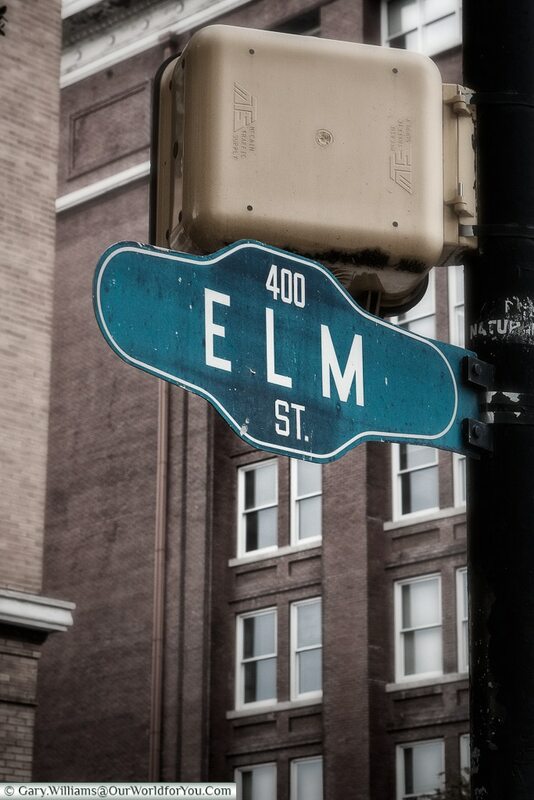 Now only a handful of people remain along with rusting remnants of the past. 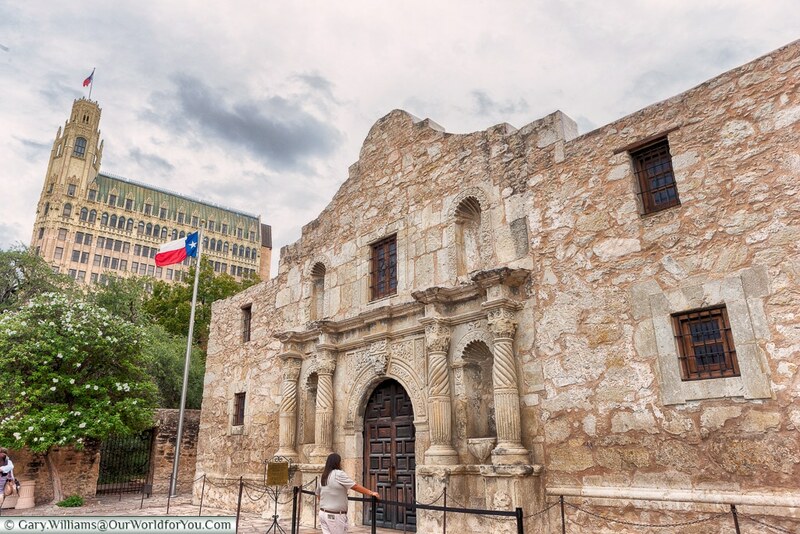 San Antonio – We stayed here for a couple of nights at the beginning of our trip. Full of history, particularly at the mission which was the site of the “Battle of the Alamo” in 1836. The Alamo mission is one of five missions along the San Antonio basin which were declared a UNESCO World Heritage site in 2015. 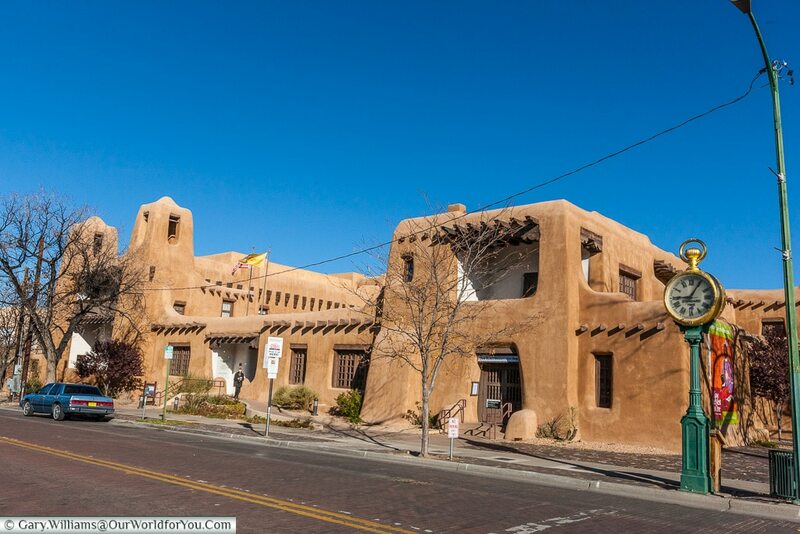 Santa Fe – Our stay in Santa Fe was a little too short. However, we made the most of our time and enjoyed strolling around the charming downtown streets amongst its ochre buildings. Start creating your own North American adventure and discover the colourful towns & cities in Texas and New Mexico yourself, British Airways & Virgin Atlantic are just a couple of options. 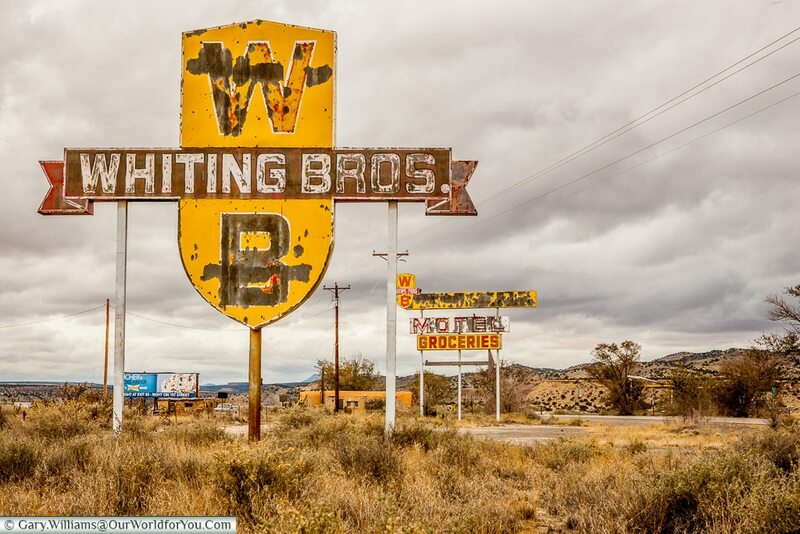 Route 66 – As this is a road trip we wanted to search out parts of Route 66 that time had now forgotten. It’s sad to see the remnants of the passing of time, but equally so intriguing to imagine how this busy route would once have been. 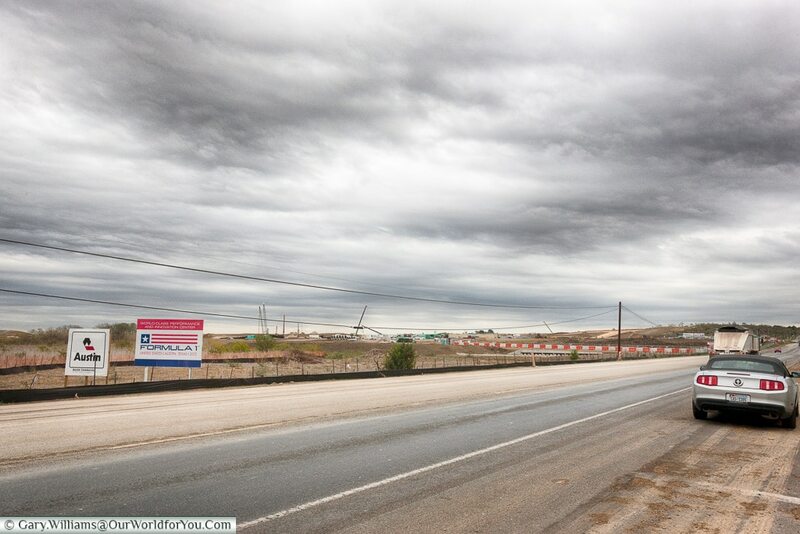 F1 Circuit of the Americas – Wherever we are in the world Gary seems to find a motor racing circuit, whether it’s in a state of disrepair, a small local track or in this case, still being built. However, the opportunity didn’t pass us by, and we witnessed its development in its early stages. 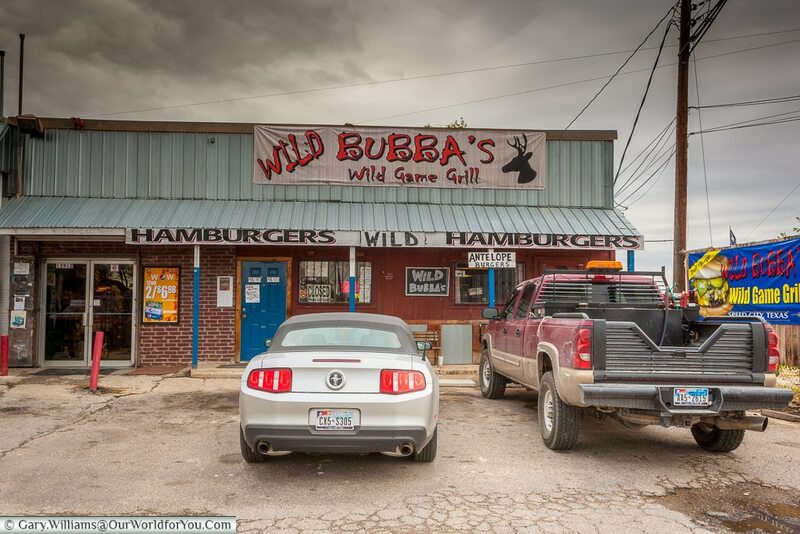 We also took the opportunity to have lunch at ‘Wild Bubba’s Wild Game Grill’, not too sure if they had a vegetarian option!!!! 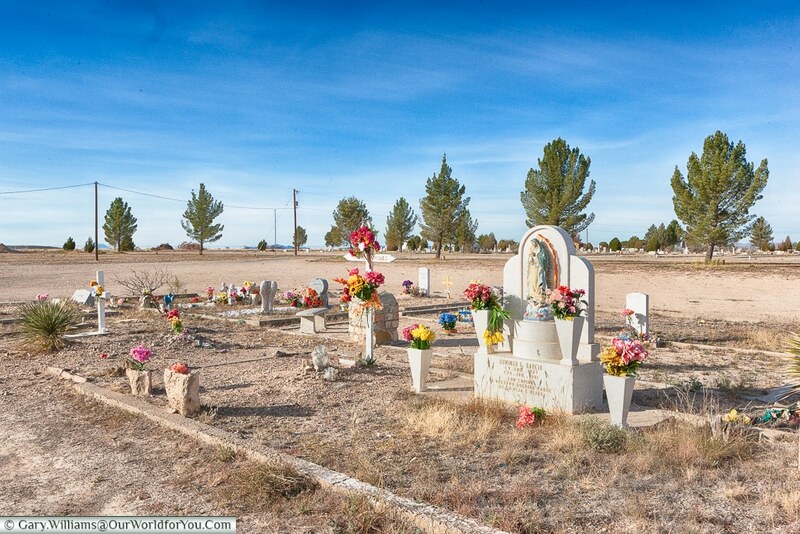 Marathon & cemetery – Marathon was our base while we visited Big Bend NP. A very quiet town with not too many folks. It felt like you were intruding by wandering around, but equally fascinating to see the difference in people lives, with the railroad tracks cutting through the middle. A chance natter with a local, who was watching our curiosity, pointed us the direction of the local cemetery to see its contrasting religious celebrations of the dead. Little did he know about my fascination with cemeteries. 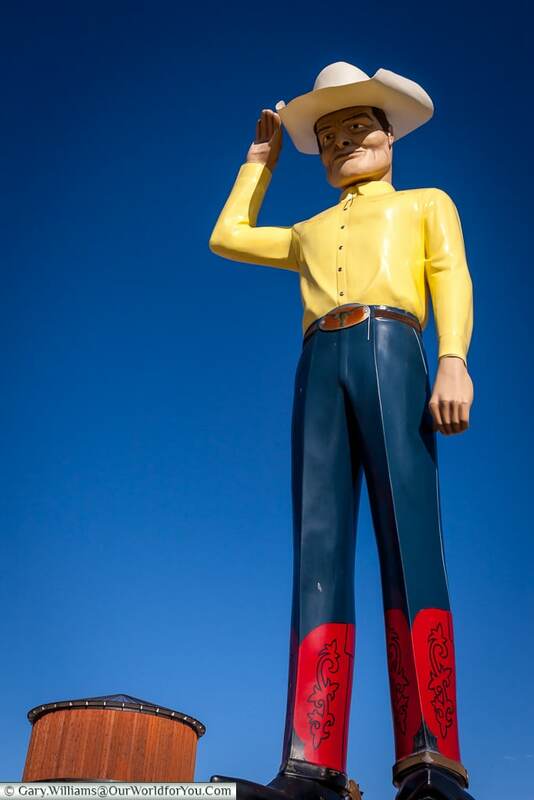 Muffler Man – we couldn’t pass by this chap without stopping. Cadillac Ranch – We have photographic evidence that we were there, after a quick pit stop at Home Depot (my dad would have been proud). 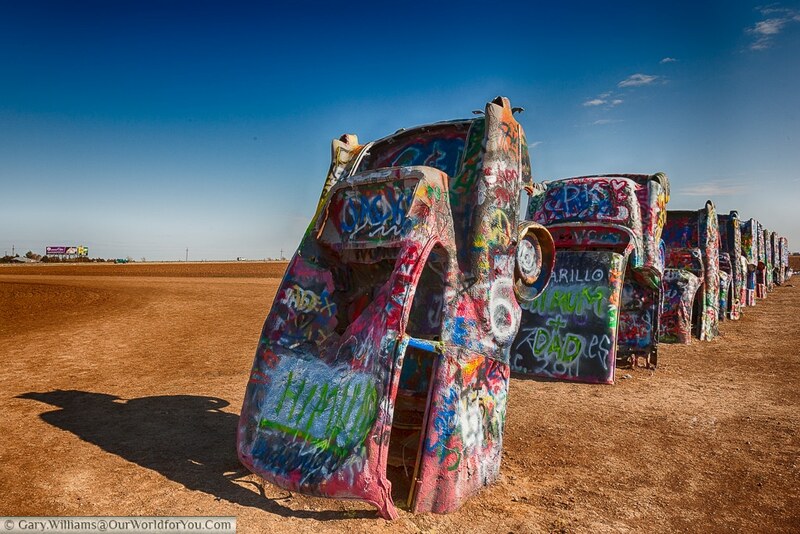 We’re armed with our spray cans and head to The Cadillac Ranch. We add our own piece of graffiti to the nose-dived caddies, which probably didn’t last an hour before others added their mark. 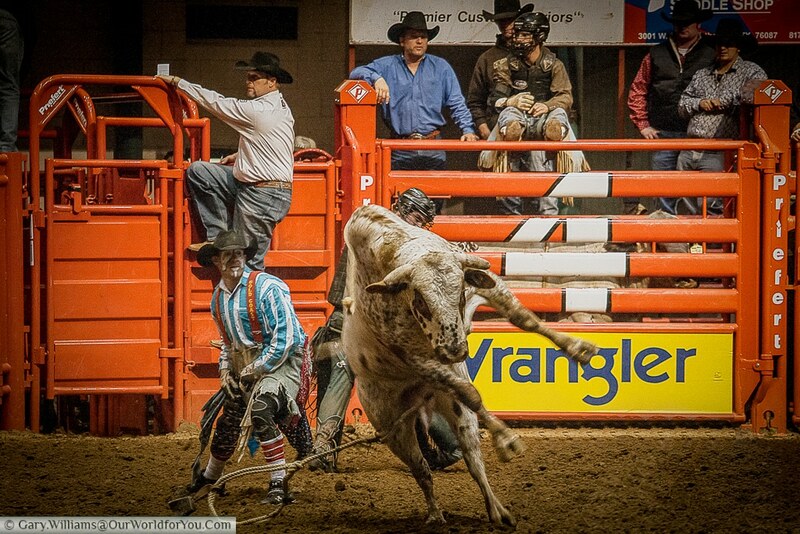 Rodeo – I thought this was going to be very staged, and yes, I know it is to some degree. However, there’s no way I’d want to be thrown around like those guys. Even if I had a clown to help me out. 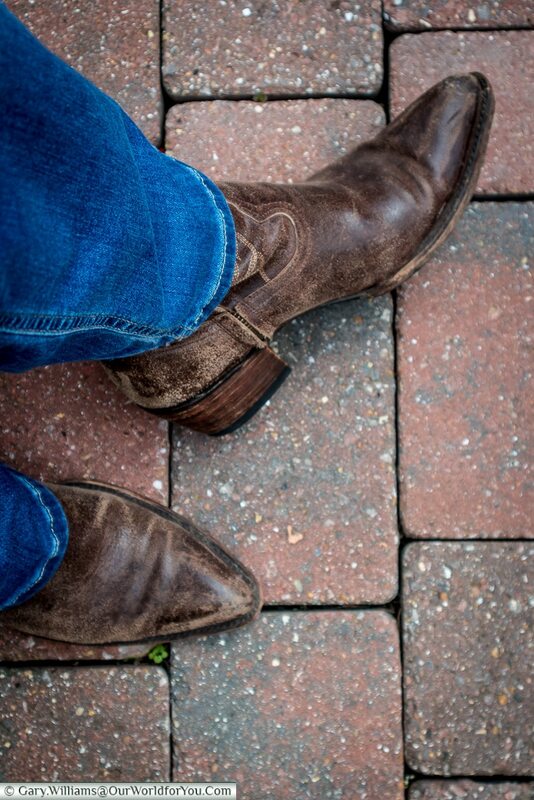 Cowboy boots – Who would say no to a pair of cowboy boots? I certainly couldn’t. And to help make your decision smoother, Mavericks even offer you a complimentary beer while deciding. Mosquero – We came across this little village in New Mexico while heading on to Amarillo, we just couldn’t help ourselves and had to stop. 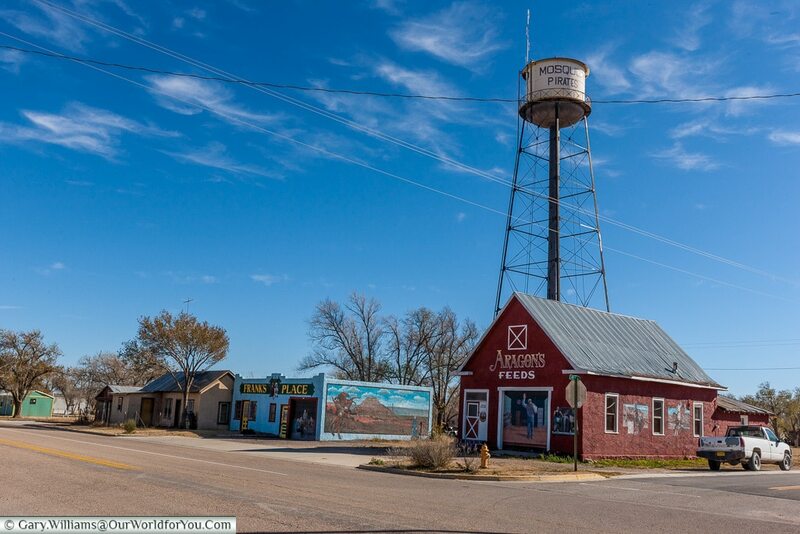 A local project was underway to ‘Paint the Town’ and not just your usual masonry paint, this village of barely 100 people went that extra mile. We only managed to fleetingly visit Austin due to lack of time, so I would love to return one day. Now we’re going back a few years here, and this road trip took us to Amarillo, Texas. It seemed only appropriate to blow into town, with the roof down blasting out Tony Christies’s ‘(Is This The Way To) Amarillo. Juvenile, but we enjoyed ourselves. Not having yet returned to enjoy a Formula 1 experience in the USA. Don’t forget your Visa/ESTA and your biometric passport. If you are driving in the evening around Big Bend NP watch out for the beady eyes of the local wildlife, they may decide to dart across the road. Stockyards Rodeo is only on a Friday & Saturday evening. 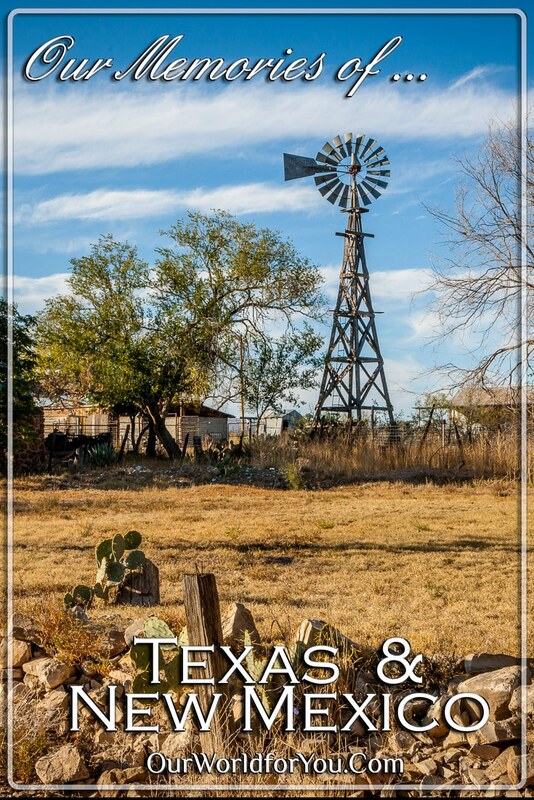 Inspired to visit Texas & New Mexico? 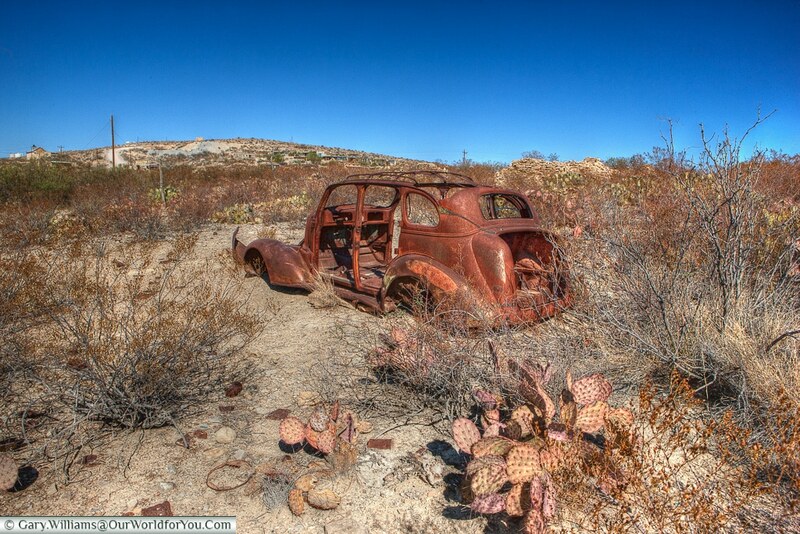 Take to the highways and build your own Texas & New Mexico road trip. There is so much to discover in this region and why not throw in an F1 Grand Prix in Austin.